If you’ve been on the hunt for the perfect acrylic necklace, we’ve got the customization options you need to create that one of a kind piece! With several designs available and a rainbow of colors to choose from, our high-quality acrylic personalized jewelry will be the perfect gift for yourself or a friend. We offer monograms, initials, and unique fashion designs, all with custom options the make them uniquely yours. Our acrylic personalized jewelry is perfect for bridesmaids’ gifts! Monograms and color choices can be custom chosen to match your friend’s unique style and personality. Initial and monogrammed jewelry is timeless and will be appreciated and worn season after season. A custom acrylic necklace is a great gift choice, even if you’re budget conscious! Made with durable acrylic and a choice of chain material, you can design a necklace that is sure to be worn often without worry. Our acrylic color choices range from pale to bright, opaque to translucent, even some with glitter and mirrored finishes! The possibilities are endless -- you may have trouble deciding which ones to choose! Celebrate a trip or event with a group of special friends and design an acrylic necklace to commemorate it! Personalized jewelry can be the perfect accessory to remember special moments, people, and even places – wearing it tells a story significant to you! Ordering our personalized jewelry is easy: just browse our selection, choose your monogram or initial, select a color, and your order is custom-made with a quick turnaround time. Getting the perfect gift for friends or family has never been simpler! 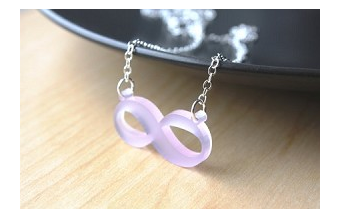 Shop For An Acrylic Necklace Now!